Armorica társasjáték - Magyarország társasjáték keresője! A társasjáték érték! Az Armorica egy remek társasjáték, 2 - 4 játékos részére, az átlagos játékidő rövid, csak 30 perc. A társast, 12 éves kortól ajánljuk kipróbálni. A játékmenet erősen épít a kártya húzás és a minták mechanizmusokra. It is 100 AD and the Celtic nation of Armorica (Brittany) has been conquered by the Roman Empire. Now, the administrators of Armorica try to increase their prestige by attracting wealthy Romans immigrants. However, Roman Patricians have expensive tastes, and it will take a lot of development to make a barbaric province like Armorica appealing. Armorica is the third game in Vainglorious Games' Celtic Nations series. It is a challenging card-drafting game, in which players must anticipate the likely choices of their opponents in order to win. Each turn, players select cards from face up displays and add them to their personal tableaus. 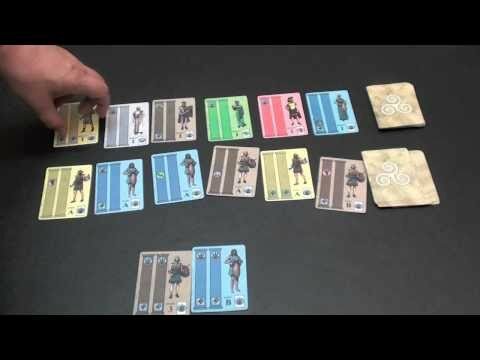 Icons in player's personal tableaus increase the range of cards from which they can select, allow them to retain more cards in their tableaus, and provide different sources of victory points.